The late nineties as well as the advent of the new millennium has brought about a renewed interest in bands and music from the sixties and early seventies. One of these bands is Clear Blue Sky. Originating from Acton, London, the original line-up of Clear Blue Sky was a trio consisting of John Simms, Ken White and Mark Sheather. The three were childhood friends, even attending the same school (The Duhig brothers who would go on to form Jade Warrior also attended the same school). Their musical roots lay in the blues infused rock that had popularised in the United Kingdom by veteran bluesmen such as Alexis Korner. The first band that they formed was called Jug Blues and they started to tour the college and club circuit. Band names changed from Jug Blues to Matuse and then X and the group even toured Germany thus gaining a considerable amount of experience. Apart from the usual chore of cover version the group also started writing its own material, which started to be introduced into the live sets, and was generally well received. The band's breakthrough came when they won the marquee Club talent contest and were immediately snapped up by Donovan's manager Ashley Kozak. The fact that they had such a high-profile manager enabled the band to be increase their profile, thus obtaining better gigs as well as securing a record contract. With everything falling in place the band hooked up with the Vertigo label, a label known for its recruitment of new bands that were creating (still) experimental sounds ranging from heavy blues to progressive rock. A record contract also meant a change of name and Clear Blue Sky was born. Thus in spring 1970, the band entered Island studios, next door to Led Zeppelin who were busy recording Led Zeppelin II. Production was entrusted to one of the hottest producers at that time, Patrick Campbell-Lyons, who had played with Nirvana (the UK band!) a few years previously. The band were still barely eighteen, but the music they created was innovative in that it combined that heavy blues edge with the free flowing forms of psychedelia and the complexity of progressive rock. 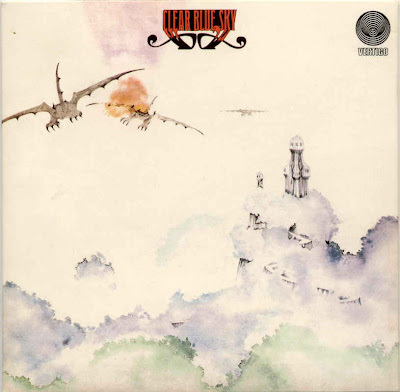 The album artwork was done by Roger Dean, one of the earliest pieces of work to be done by the now legendary artist. Thus Clear Blue Sky (Vertigo 6360 013, gatefold sleeve, spiral label, value BS 35.00) was released in January 1971, alongside releases by bands such as Black Sabbath and Juicy Lucy. The album would be issued in Europe under a different name, Play It Loud as well as with different artwork. The group toured extensively and made a name for themselves with their style that was harder and heavier than many of the bands in circulation, yet they were continuously open to experimentation and improvisation. In fact their recordings were made live in the studio with a minimal amount of takes. The band were also featured on a Vertigo compilation Heads Together/Round One (Vertigo 6360 045, 2-LP, gatefold sleeve, spiral label, Value BS20.00) as well as on the compilation The Vertigo Trip with the track Birdcatcher included. However the continuous touring had its toll on the band, whose members were still teenagers when the album was released and in 1975, John Simms decided to disband the group and join Tangerine Peel. Mark Sheather got married and disappeared from the musical scene, but Simms would later team up with Ken White and Smith Campbell (Hokus Poke) to form The Needle. The Needle would also be disbanded with Simms gong on to join fusion group Separate Energy, The Ginger Baker Band and Karizma (with Ginger Baker's son Kofi). Thus the mid-seventies and the whole of the eighties came and went by without any news from Clear Blue Sky. However the nineties brought about renewed interest in the band, whose debut (and only) album was still selling healthily via independent record labels such as Repertoire and Si-Wan. Furthermore, there had long been a rumour circulating amongst the band's fans that there lay within the vaults two unreleased albums by the band. 1990 was the year that Clear Blue Sky fans were waiting for as a new album was released. No new material was recorded, but instead material recorded in the seventies was given a brush up and an album released. The album was called Destiny (Saturn SRLP 101, Value BS 10.00) and was released in limited quantities on vinyl and cassette on the Saturn label. That same year the band were invited to play at the 20th Anniversary of the Isle Of Wight Festival. This was the perfect excuse for the band to reform and play material that had not been heard live in close to twenty years. Furthermore in October of that year, Vertigo released the compilation album Vertigo Classics And Rarities which also featured Rocket Ride, taken from the band's debut album. Following further touring, the band began to attract interest from record companies and they were signed to the Aftermath label, which immediately released the Destiny album on CD (AFT 1005) with new artwork by Phil Schmee. Not only was the interest in the band coming from record companies, but fans from all around the world were clamouring for new releases from the band. However before this was done, the group had to changed radically. The power trio, that was so popular in the late sixties/early seventies, was expanded to a quintet to include a keyboardist (Adam Lewis) and a female backing vocalist, John Simms wife, Maxine. This move allowed the band to explore further the dimensions of rock music and move into the realms of space rock as well as maintain their heavy blues style. The new album was also a concept album and was titled Cosmic Crusader, based on a science fiction theme and was released in 1996. The Ginger Baker link was also revived with the artwork entrusted to his ex-wife Elizabeth Finch. In 1998, the new album also received a mention by Barry "Mr Vertigo" Winton in the liner notes to the new Polygram 2-CD compilation Still Dizzy After All These Years that included My Heaven. The new millennium also saw the band celebrating their thirtieth anniversary and this was done with the band gong into the studio to record a new album as well as release an album of live and unreleased tracks. It's time to replace mp3 by losless. Thanks a lot. I've been really enjoying this, thanks for the upload!